Why have we headed back to the UK now when winter’s approaching fast? You’re asking. We’re asking ourselves the same question! We were planning this return in late autumn for several reasons (finances, not wanting to spend another winter in the confines of a small van, sorting the MOT, post and of course catching up with family and friends). 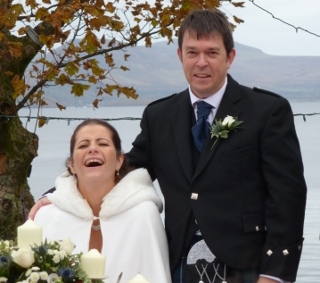 When a friend texted us to invite us to her wedding by Loch Lomond in late October it gave us a date to aim for and plan around. It took a few days, back in Romania, to get our heads around having a set end date for our travels in mainland Europe, but once we had mulled it over, it felt good to have something so joyous to come back for. I had this quote very much in mind as we arrived back in the UK to low thick clouds and rain, and the overwhelming sense of the familiarity of everything threatened to wipe out the last year and a half of travelling from our thoughts quickly. After the initial shock of arriving back, we have been looking at our country with fresh eyes. Trying to anyway. On entering every new country on the trip our eyes are open to all the new things about that country, the people, the scenery, the things in the shops. The people have been very friendly so far – is this just a language thing? I don’t know, but most people have been surprisingly upbeat – Andy at Campershack, the MOT tester, the tyre courier, the waitresses where we had our first fry up, people in shops and on trains. Our friends and family have been pleased to see us too, in spite of us turning up at little or no notice. It’s relaxing to not have to worry about what language to use, how to ask for things. We know the shops, we know they will more than likely have exactly what we expect them to have. If we ask for six slices of salami, we won’t get 600g (there was a week in Serbia where our sandwiches did get quite boring after a while). Is this all much too predictable though? After a few days of sorting ourselves and the van out, swapping summer stuff for winter stuff and digging wedding clothes out of storage, we were ready to hit the road again, northwards en route for Loch Lomond and Claire and Stephen’s wedding. What a location and what a wedding. 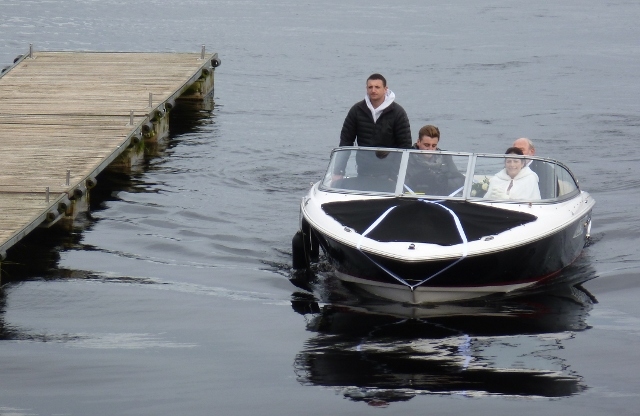 Who would believe that you could have the ceremony outside above the Loch in late October, with the bride’s grand entrance… whizzing in by speed boat, in her warm furry hooded white cloak over her dress. The food and company were great, and the dancing went on until the early hours when the brilliant band rounded off with a rock rendition of the Bonnie Bonnie Banks of Loch Lomond. The Cruin venue kindly let us overnight in their car park. The rain set in though and the view next morning wasn’t what it might have been. We then headed on to Inverness to visit my cousin and his family for another warm welcome – it has been too long and new babies are suddenly five years old. The journey north was a timely reminder that however far you may travel, the landscapes of the British Isles will still take your breath away. 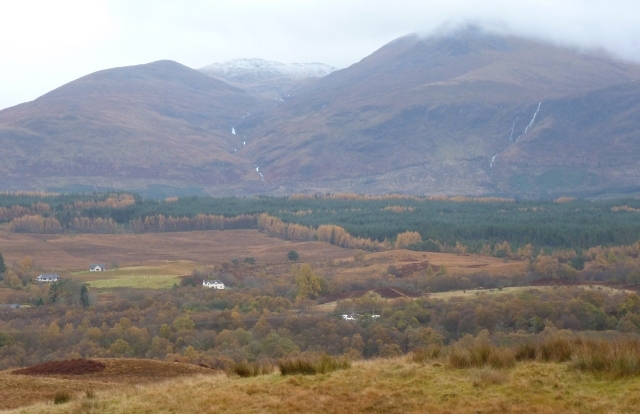 Scotland’s lonely cloud-shrouded moody mountains, the incredible orange moorlands and purple hills. Gushing waterfalls and rivers, distant snow dusted tops, deep mossy bark forests. Our eyes were opened once again to how much this country has to enthrall us, in spite of the weather. Our time up here is short, most campsites will close in a few days’ time, and we have other things on our return to the UK to do list…but we vow to come back and enjoy Scotland in more depth. It is hard not to stop and explore the back roads like we’ve been doing for so long, and instead keep to the boring, but time-saving, old motorways. A pigeon struck our high top window cracking both sides of the plastic double-glazed pane. With a £100 excess, this is an extra expense to add to our growing van parts shopping list. We were just relieved not to find the remains of the culprit embedded in the window, and were glad it wasn’t one of the many birds of prey we’ve seen soaring close to roads on our travels. I made a brief visit to London to surprise my book club meeting. They nearly fell off their chairs and there was, just as before I went away, a long evening of wine, cocktail sausages, stories and laughter. I thought I knew London by heart, but after a time away, your memory lapses and I found myself on the Jubilee line which hasn’t stopped at Charing Cross for decades now. I got off at Waterloo and walked back across Hungerford Bridge. 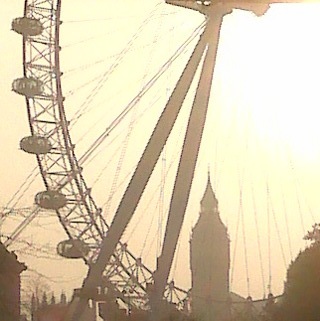 The heart of London. I paused to remember the great cities we’ve been to of late. How does London compare? Nothing can really take its place in my heart as I listened to the sounds of the river, the traffic, the steel drum busker, and the cityscape emerged before my eyes in the misty late afternoon sunlight. This was the first time I had been apart from Adrian for more than two hours in seventeen months, and time spent alone has become as precious as the time we’ve spent together. Our travels go on. More catching up with family and friends around the country. We don’t have a home – it’s still rented out to friends for the time being. We still don’t know what we’re going to do next. We’re determined not to fall back into the old ruts we made our escape from. We know more clearly what we don’t want to do. But we don’t yet hear the call to what we want to devote the next part of lives to. Yet. Except that it must include more travelling. We don’t know where we’re going, but we’re definitely on our way. This entry was posted in By Country - UK, Personal stuff, Wildlife stuff. Bookmark the permalink. Ellie, we visited Scotland this summer..well a long drive through from Devon to reach Orkney and realised there are vast swathes of this country we don’t know well at all. 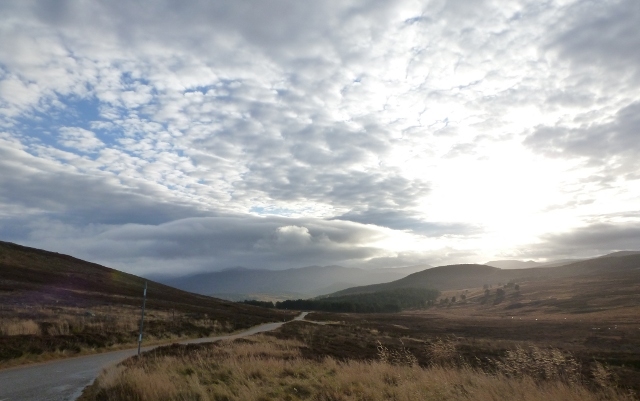 I would head to Orkney again like a shot and thence to Shetland but the drive up through the Great Glen was memorable, stunningly beautiful too. Something about Orkney captured my heart, a truly magical place… You would love it too I feel sure so definitely add it to your list. When we left in May ’11, the last thing we did was get a new MOT – despite the old one still having about nine months left. That meant we could re-tax the van online in Jan ’12, without any problem. When that MOT expired in May ’12, we opted to wing it. I looked through our insurer’s paperwork very carefully (the joys of a downloadable PDF, so searchable…) and there was no mention of MOT in the small print at all. However, it was mentioned explicitly in the breakdown cover section, which our van was too old to be eligible for anyway. There was explicit mention of the van being roadworthy, but the MOT certificate itself is very careful to state that there is no relationship between “current MOT” and “roadworthy”. So… the angle we took was to view it as a sin of omission, not a sin of commission. No tax would mean SORNing, which would be an outright lie and probably cause more problems on our return to the UK. No insurance would, obviously, not be an option. But – so long as the van was roadworthy – I was happy with not having a current MOT. Since I’m mechanically competent (stop laughing, everybody), that was easier, since whilst a second pair of eyes and proper equipment is a good thing, I’ve regarded the MOT standard as a bare minimum not a once-a-year highpoint of vehicle condition. When we got back, we were strictly speaking legal, even driving in the UK without a current MOT, since we were heading straight to a pre-booked MOT. Which we passed with minimal work, just one steering balljoint. Thanks interesting to read how you did it.